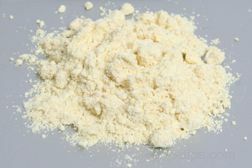 Garbanzo bean flour is a variety of flour that is most often used in East Indian and Middle Eastern cooking. Garbanzo beans, also known as chickpeas, are processed into a flour that is very similar to millet providing a rich sweet flavor to baked foods. Since it is gluten-free, it must be combined with another flour containing gluten (such as wheat) in order to produce risen breads. Mung bean flour is a type of fine textured gluten-free flour made from ground mung beans. 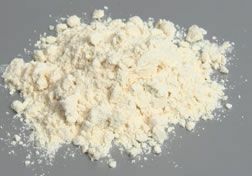 The flour is common in foods from India where the bean originates. Mung bean flour contains a starch that is beneficial in making several varieties of thin, transparent noodles referred to as bean threads or cellophane noodles. The noodles are high in calcium, magnesium, and phosphorous. Mung bean flour is also used to produce a variety of sweet pastries and breads. 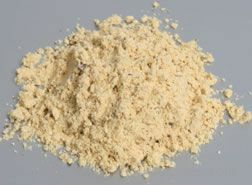 Soy flour is a high protein flour ground from roasted soybeans. Among the varieties available are full-fat, low-fat, and defatted soy flour. The more fat (in the form of soybean oil) included in the flour, the greater the likelihood that the flour will develop an off flavor if it is not stored properly. It is best to store full-fat soy flour tightly wrapped in the refrigerator or freezer. Soy flour is high in protein and it can be added to wheat flour when making baked goods to boost the protein level of some products. It contains no gluten, so it cannot replace wheat flour entirely. It is best to substitute no more than 25% to 30% of the total volume of wheat flour with soy flour to ensure the best results when baking. Soy flour is available in many large food stores as well as natural food and health food stores. A type of flour, commonly used in India, made by grinding black gram pulses or lentils into a fine powder. Urad flour is often used for making dosa crepes, idi cakes, and uttappam, which is similar to a pancake. Urad flour may also be referred to as urid flour.